Joshua Tree National Park, located in Southern California’s high Mojave Desert, is a wonderland of rugged rock formations and twisted, spiky Joshua Trees. The area draws primarily rock climbers and hikers, but also photographers who love to marvel at and document the surreal landscapes, campers who enjoy the welcoming community, and all visitors can enjoy the exposed, yet cooler temperatures that this high desert provides. 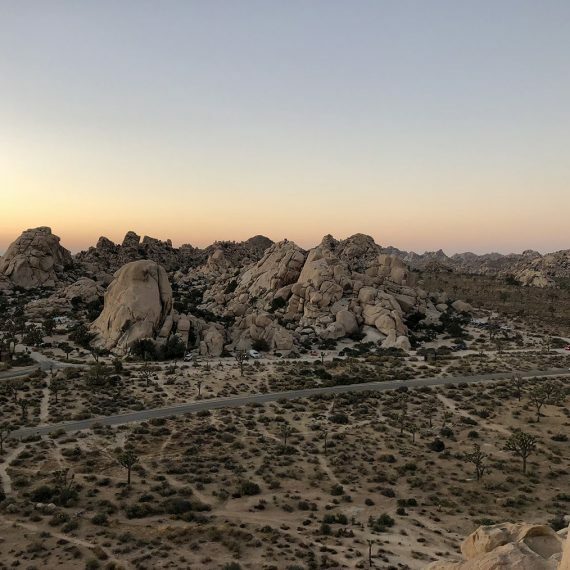 The hiking trails of Joshua Tree weave over and through boulders, and the countless amount of routes and grippy granite make exploring Joshua Tree rank high on many adventure seekers’ bucket lists. A few landmarks and activities one should make sure to check out when visiting Joshua Tree National Park is a hike up Ryan Mountain – the park’s second highest point, which provides panoramic views of the heart of Joshua Tree, Oh-Bay-Yo-Yo – a hidden cave from the early 1900’s, Key’s View – another high point in the park known for watching the sunset, climbing at the popular Hidden Valley, as well as various rock formations such as Arch Rock, Skull Rock, and Split Rock. At night, don’t forget to look up and stargaze! Joshua Tree has been given International Dark Sky status for good reason. AOA’s 3-day hiking trip is the perfect introduction to this wild desert park. Plan that weekend escape you deserve and head for warm winter weather! Our comfortable basecamp setup is offers a plush outdoor home immersed in the desert while daily guided hikes help you get to know the park.